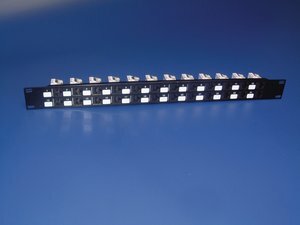 Description The modular patch panel is designed to accept HellermannTyton Category 6A, 6 and 5e UTP modular jacks and connectors, providing flexibility in multimedia installations. These modular panels can be mounted to any standard EIA 19" rack, cabinet or wall mount patch panel bracket. HellermannTyton pre-numbered modular patch panels are available in 12,16, 24, 32 and 48 port configurations. 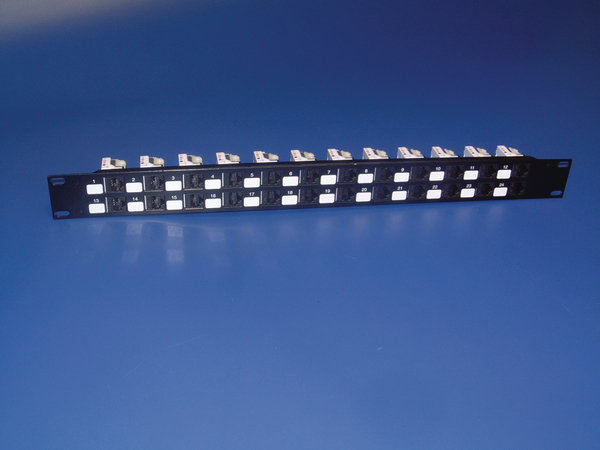 Features and Benefits The modular patch panel is designed to accept HellermannTyton modular jacks and connectors, providing flexibility in multimedia installations. It allows the design of a custom panel specifically suited to different applications including coax, voice, audio, video and fiber. Once the connectors are snapped into the panel, they are flush with the front of the plate. These modular panels can be mounted to any standard EIA 19" rack, cabinet or wall mount patch panel bracket. HellermannTyton pre-numbered modular patch panels are available in 12, 16, 24, 32 and 48 port configurations. HellermannTyton’s 1U modular panel allows for increased density in one rack space. The panel also makes patch cord insertion and removal easy by having jacks mounted sideways in the panel.